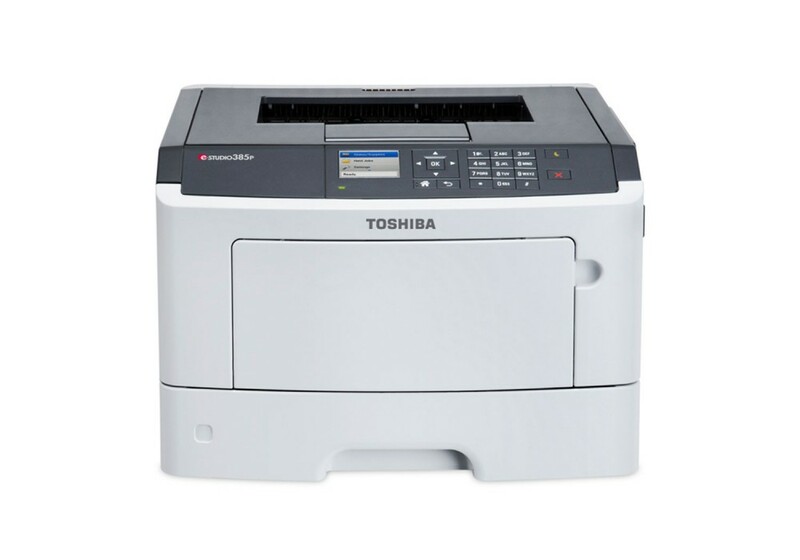 If you are looking for a reliable A4 monochrome printer, search no more. The e-STUDIO 385p offers fast and reliable high-quality document output and is ideal for small businesses and workgroups. You choose how you want to connect to the printer: whether you want to use the system as an individual desktop printer, connect it to your network or prefer mobile printing – everything is possible. Complying with the highest international environmental standards, the e-STUDIO 385p comes with features which will help you save valuable resources. • Ideal for small workgroups the e-STUDIO 385p monochrome A4 printer offers an reliable document output at a speed of 38 pages per minute and a paper capacity of up to 850 sheets. • Thanks to a resolution of up to 1,200 x 1,200 dpi your documents are printed in high-quality and will impress with the crystal-clear images and graphics. • The intuitive usage of the colour LCD display gives you easy access to all functions and informs you about your job status. • Advanced print functions cover all needs of your day-to-day business and help you enhance your efficiency. • To help save resources the e-STUDIO 385p has energy saving modes and the duplex print function as standard.